Over two decades ago a friend of mine, a poet, needed a place to write, along with a bank of drawers in which to keep small writing materials and mementos. I built her this desk, of which this is the only remaining photograph. 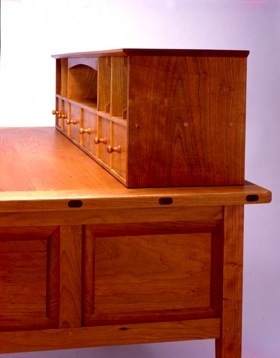 The desk had four drawers, two on each side of the kneewell and six small matching drawers up in the cubby on top of the desk.